Blokovi (Serbian Cyrillic: Блокови, English: "Blocks") or Novobeogradski blokovi (Serbian Cyrillic: Новобеоградски блокови) is the semi-formal plural name for a group of urban neighborhoods in Belgrade's municipality of New Belgrade. The neighborhood is located in the southeastern urbanized section of the New Belgrade municipality, on the left bank of the Sava river, across from the islands of Ada Međica and Ada Ciganlija. It is bound by the neighborhoods of Bežanija and Bežanijska Kosa from the north, Block 58 from the southeast (neighborhood of Savski Nasip) and the neighborhood of Dr Ivan Ribar from the west. When construction of New Belgrade began in 1948, the area designed for the future urban expansion was divided in 72 blocks (with several sub-blocks, like 8-a, 9-a, 9-b, 70-a, etc., and some numbers are missing). Not having any specific name like most other parts of the newly built New Belgrade, over time, this area became colloquially known simply as Blokovi (The Blocks). The population of the neighborhood is 79,310, including the neighborhood of Dr Ivan Ribar. But the boundaries of the Blokovi neighborhood are very informal and roughly can be divided into two sections separated by the Yuri Gagarin Street: the north part or, so-called Bežanijski blokovi ("Bežanija Blocks") and the south part or Savski blokovi ("Sava Blocks"). The neighborhood is known for its two rows of over one hundred residential buildings, especially blocks 45 and 70 with original setup of two sets of 21 (totalling 42) identical four and two-story buildings close to the river, with large playgrounds in between, and two sets of over 40 (totalling 80) similar red brick skyscrapers close to the Jurija Gagarina street. 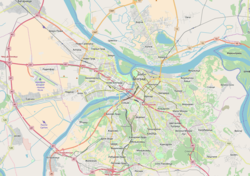 The area close to the river is a continuous embankment on the Sava river, stretching throughout the whole neighborhood, known as the Sava riverbank (Serbian: Savski kej/Савски кеј). The rows of two-story and 4-story buildings in Block 70 and especially Block 45 are also known as "Naselje Sunca" (Serbian Cyrillic: Насеље Сунца, English: "The Sunny Community"), because of the peaceful environment ideal for kids and optimism and positive energy that prevailed in 1970s Belgrade. Also, the Block 45 was inhabited by a large number of artists and intellectuals, though the structure of the population has changed a bit since the 1970s. The Galovica canal, which flows into the Sava, drains the large area of the east Syrmia and the Fruška Gora mountain, due to its interconnections with the Jarčina river-canal system. As streams in the upper watershed flow through the numerous settlements, farms, industrial and artisan complexes and warehouses, wastewater pollutes Galovica. In addition, various smaller drainage canals also pollute the Galovica, which then empties large amounts of untreated sanitary and technological wastewater into the Sava. The residential complex of Block 45 was built from 1968 to 1972, when the first tenants moved in. The block was fully settled in 1973 and 1974. Prior to 1968 the land along the river was a thick forest while the inland was a swamp which was drained and filled with sand. The area was known for its wildlife, especially the water birds. The block covers an area of 62 ha (150 acres) and has 45 skyscrapers and 23 4 and 2-storey buildings. Chief architects were Grgur Popović (who designed the skyscrapers), Mihailo Čanak (8-storey buildings) and Rista Šekerinski (4 and 2-storey buildings). The complete urban arrangement of the block continued in the next several years: green areas (trees, lawns), promenades, school, kindergarten, etc. By 1974, the quay along the Sava was finished. In the westernmost extension of Block 45, where the canal Petrac flows into the Sava, there are two wild beaches on the river bank, "Bombaj" and "Petrac". Until the Block 71 in the future neighborhood Dr Ivan Ribar was built, Block 45 was the last section of urban Belgrade on this side, after which the Syrmian arable fields began and the Galovica canal was located. The neighborhood was colloquially named Naselje sunca ("Sun Settlement"). It was described as an "utopian, biopolitical project, constructed in the sunset of the Yugoslav socialism". An exhibition titled "45 years of Block 45" in the artistic Savamala neighborhood in March 2019 marked the 45th anniversary of the block. The neighborhood is entirely residential, without any industrial facilities. A commercial sector began to develop alongside the Jurija Gagarina street in the 1990s, and expanded in the 2000s. Block 70: several shopping malls including a Chinese market, OMV gas station and large postal facilities (including two separate post offices); it also has a primary school "20. oktobar", kindergarten and its own local community (Serbian: mesna zajednica) of Savski kej. Block 44: green market, several shopping malls including one of the first modern super-malls in Belgrade, the Piramida (Serbian for pyramid, because of its shape) and a McDonald's restaurant; it also has two medical clinics. Block 45: four shopping malls, including "Enjub"; it also has a primary school Branko Radičević, once the biggest elementary school in the Balkans, which had elite quality education - winning many federal level prizes at competitions in subjects such as mathematics, literature etc., kindergarten, nursery, FK Sava's soccer field and its own local community of Sava. Aqua park Belgrade, announced as the second water park in Serbia after one in the town of Jagodina, was an ultimately failed project in Block 44. Construction began in August 2005 and it was supposed to be open on 25 May 2006, but as of August 2006 only 75% of the preparatory works had been completed. Investors claimed it would be open for the 2007 season and it would feature the longest "family waterslide" (117 meters) and lazy river (405 meters) in Europe so as the largest pool in Europe with an area of 1,600 square meters and children's complex (Kids City). Also, in phase two, the surrounding area of 2 hectares was to be arranged with covered pools, bowling alleys, ice rink and other sport facilities. One of the leading investors in the project, basketball player Žarko Paspalj, announced that the opening had been postponed for 2008. The construction resumed in January 2008 and the new opening date was set for late May 2008. The investors changed but the construction site never looked like anything more than a dug meadow. Despite quite strong public campaign for several years how Belgrade will get aqua park, which was supposed to be an investment of 15 million euros, “due to the financial problems”, the project was scrapped in 2010. A new park, Park Block 70, was opened in 2011 and is one of the youngest parks in Belgrade. It is located in the east-central section of the Block 70, along the Lazaro Cardenas promenade. It consists of the open green areas, children's playground, fitness equipment in the open, small wooden pavilion and 158 tree seedlings. Routes of the public transportation lines pass through all of the streets in the neighborhood: bus lines 45, 68, 73, 76, 81, 82, 89, 94, 95 and 610 and tramway lines 7, 9 and 11. In 1922 company "Čavlina and Sladoljev" from Zagreb drafted the project of connecting two banks of the Sava river by the cable car. In 1928, building company "Šumadija" again proposed the construction of the cable car, which they called "air tram" but this project was planned to connect Zemun to Kalemegdan on Belgrade Fortress, via Great War Island. The interval of the cabins was set at 2 minutes and the entire route was supposed to last 5 minutes. The project never realized. Engineer and CEO of the Yugoslav institute for urbanism and dwelling "Juginus", Mirko Radovanac, revived the idea in the 1990s. After conducting extensive surveys (traffic analysis, interviews with the commuters, climatic, geological, urban and other researches), "Juginus" presented the project in 1993. They proposed that the terminuses should be at the Sports Center Košutnjak and Block 44. Stops in between would include the major public transportation roundabout in Banovo Brdo, Makiš and Ada Ciganlija, five in total. They called it the "ideal route". The plan also included construction of commercial areas around the terminuses, which would cover 2,000 m2 (22,000 sq ft) and help with the profitability of the project. Apart from being ecological and an attraction, it was estimated that it would shorten the trip for 45 minutes. City government included the project into the city's GUP, which envisioned the construction in phases, the first being a 1,000 m (3,300 ft) long section Block 44-Ada Ciganlija. It would lay on 8 steel pillars, 35 m (115 ft) above the ground and the trip would last for 3 minutes. The cabins were projected to receive not just the commuters, but also the bicycles, skateboards, sledges and skis, as the cableway was planned to work year-round. The complete facility would have of 27 pillars, it would be 5 km (3.1 mi) long which would be travelled in 15 minutes by 2,000 commuters per hour. Despite the project has been publicly revived by the mayors Dragan Đilas (2008–13) and Siniša Mali (since 2013), as of 2017 the project still didn't start. Bežanijski blokovi are built on the southernmost uninhabited area of the former Bežanija village, thus the name. However, it is completely urbanized and even though different architecturally from the southern section, it also features a series of residential skyscrapers in two parallel rows, stretching through the blocks 61, 62, 63 and the western section of 64. There are over 50 skyscrapers altogether (22 parallel ones with several additional in between). Bežanijski blokovi are also known as "Oficirski blokovi" (or, in English, "The Officers' blocks"), since a large portion of the apartments in the buildings were owned by the old Yugoslav army, which housed its personnel there. Consequently, a large portion of the inhabitants of the Bežanijski blokovi are the families of the retired army officers who bought out their apartments from the Army. Southern border marks the Jurija Gagarina street while the northern, separating it from Bežanija is the Vojvođanska street. In between, the Dušana Vukasovića street divides Blocks 61 and 62, the Nehruova street Blocks 62 and 63 and the Gandijeva street divides Blocks 63 and 64. "Park of the Republic of Argentina" is located in Block 62. It has a proper rectangular shape and is bounded by the streets of Dušana Vukasovića on the west, Japanska on the north and Evropska on the south. It was called "Park Block 62" until 15 June 2017 when it was officially renamed to Park of Argentina. It was named in honor of the park in the Belgrade street in the capital of Argentina, Buenos Aires, Plazoleta Andrés Chazarreta. The park, formed in 2009, was renovated in October 2017 when it was announced that Buenos Aires will get a park named after Republic of Serbia. Plaza Republica de Serbia was ceremonially open in Buenos Aires on 23 November 2017, and it contains a mural with painted motifs from Belgrade and Serbia. In April 2018, Indian tractors factory TAFE purchased the bankrupt IMT tractors factory. IMT owns the vast industrial complex in the Block 64, but the TAFE didn't obtain the ownership on this land. The area, which covers 46 ha (110 acres), will be transformed into the commercial-residential complex. In addition to other bus lines, additional lines passing through or around the neighborhood are 89, 94, 95 (right through the middle), 45, 71, 72, 82, 601, 602 and 610. Population of the local communities within the neighborhood was 89,561 by the census of 2002, out of which 44,505 in Bežanija and 45,056 in Sava section. Due to the major changes in the boundaries of the local communities in parts of New Belgrade, at the census of 2011, combined population was 79,310 (Bežanija 39,418, Sava 39,892). Blokovi inhabitants represent a cross-section of the Serbian population. Because most people in Blokovi received their apartments through government-funded social programs, the population is very socio-economically mixed: it is not uncommon to have a bus driver living next door to a neurosurgeon in the same apartment block. The blocks near the Sava river, especially the four and two-story buildings, were inhabited by a large number of artists and intellectuals in the 1970s. The neighbourhood is ideal for young children, with many playgrounds and a popular boardwalk built along Sava's left bank. It is also considered as a healthy and a quiet place to live in as it has a lot of green areas, sports terrains and also a bicycle trail alongside the river. On the other hand, the officer blocks, and their grayness and drabness have earned Blokovi the reputation of some sort of urban ghetto during the 90s. This image was perpetuated by recent Serbian movies such as Rane, Apsolutnih sto, Jedan na jedan, Sutra ujutro, and Sedam i po. However, recently[when?] the erection of Delta City shopping mall, plans for Aquapark and Tennis courts near Block 45 have doubled the value of real estate in this area, at the time when New Belgrade with numerous development plans becomes one of the more desirable parts of the city. The well-known Yu-rock band Riblja Čorba has made a song with the title "Neću da živim u bloku 65" (English: I don't want to live in block 65), which can be found on the CD "Buvlja pijaca" released in 1982. Also, a grunge band from Belgrade's block 19a, named Euforia, has a song called "Blokovi". ^ Branka Vasliljević (23 March 2019). "Sava i Dunav odolevaju zagađenju, rečice i potoci postali kolektori" [Sava and Danube resist the pollution, streams and brooks turned into collectors]. Politika (in Serbian). p. 12. ^ a b c d Branka Vasiljević (3 March 2019). "Naselje sunca otrgnuto od močvare" [Sun Settlement wrestled away from swamp]. Politika (in Serbian). ^ Srđan Veljović (22 December 2018). "Осамдесете" [The Eighties]. Politika-Kulturni dodatak, year LXII, No. 37 (in Serbian). p. 07. ^ D.Vukosavljević (21 February 2013). "Istraga kra]e hektara stopirana pre pet godina" (in Serbian). Politika. ^ Aleksandar Mikavica (14 April 2018). "TAFE traži kooperante za IMT" [TAFE searches for the cooperators for IMT]. Politika (in Serbian). p. 11. This page was last edited on 24 March 2019, at 09:55 (UTC).